The Pollock Pines School District, originally known as the Cedar Grove School District, was organized May 7, 1889. The first school building was built on the site of the old 13 mile house. John and James Blair of Sportsman’s Hall fame owned the property by then and sold one and one half acres of land to the school district for $10 in gold coin. Miss Larsen taught there in 1894 and was one of the earliest teachers anyone could remember. The snow was heavy in winter and the road was closed east of Sportsman’s Hall, so school was held in the summer, running from March to Thanksgiving. Often the children would go barefooted or would carry their shoes to school, putting them on when they went into the building. Sometimes the student enrollment would drop, so the Blair boys would be imported to keep the enrollment up for the records. In 1902 Miss Bales was the teacher. There were anywhere from 6 to 15 students which included Fred and Bill Baumhoff, Harry Reece, who later became principal, the Butlers and the Shermans. School gave the children a chance to become acquainted with their neighbors. The school was a one-room, red, board school, 14 feet by 20 feet. A row of desks attached to each other lined each side wall of the room. There were only windows on the left side of the building. On cold days the students took turns keeping the fire burning in the cast iron, pot belly stove. On some summer days it would get so hot inside, that the students would take their work outside under the trees. If a student didn’t obey the teacher, he might get a slap on the wrist with a ruler. Water had to be drawn from the spring a few hundred yards out back near the lava cap. A couple of boys would be sent out to fill a 5 gallon bucket to bring back to the room. It sometimes took them two hours to return. When the spring ran dry in the fall, the water would have to be brought from the well in front of the school. A barrel was put under the eaves to catch the rain water. This water was used to wash hands and faces with one basin and one towel shared by all. The families took turns washing the towel on weekends. The toilet facilities were outside, a house in one corner of the school yard for the boys and a house in the other corner for the girls. School was recessed for any unusual or interesting event taking place in the community. Large herds of animals being driven down the road or the first car would bring all of the children to the fence to witness the event. By 1921 the enrollment had shifted because the Blairs had a mill in Long Canyon. The school was not in a condition to be moved so a new one-room school was built on Alex Baumhoff’s property north of the road just east of Sportsman’s Hall. Mrs. Belle Smith was one of the teachers at this location. The school remained here until 1931 when the building itself was moved to the original location on the 13 mile house site. Lumber mills were moved to the location of the stands of timber in early days and school was held at a location near the mills to accomodate the children of the loggers and mill workers. Blair mill had finished with its operation in Long Canyon and moved to a location near Pacific House. Many small mills were operating along the ridgetops and canyons east of Sportsman’s Hall. Thus the school had moved back to its original location. By 1935 the school enrollment was increasing steadily. The summer session school was changed to one observing the regular school calendar. A partition divided the one room into two, and Bill Baumhoff’s wife, Ruth was hired as a second teacher. The 1936-37 school year opened August 31st with about 20 students in Mrs. Anna Thomas’ class, grades five through eight. Mrs. Baumhoff was teaching grades one through four with about 35 students. 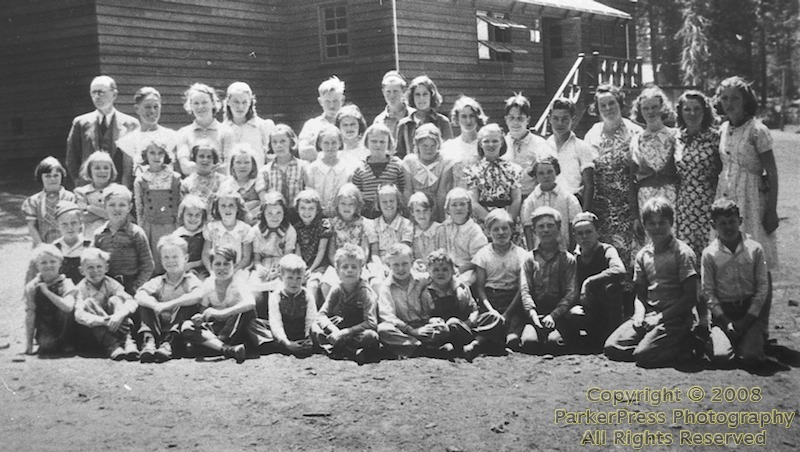 The name of the school was changed to Pollock Pines to correspond to the new community developing around it in 1937. Mr. Harry Reece was hired as principal and teacher of grades four through eight. He was a competent and well liked gentleman and continued as Principal until his retirement in the late 1950’s. A contract was awarded to Frank Schmershal of Placerville to construct a building consisting of 2 rooms, a furnace room, the necessary cloak and entrance halls and lavatories at a cost of $14,000. This marked the beginning of electricity and indoor plumbing in the local school. 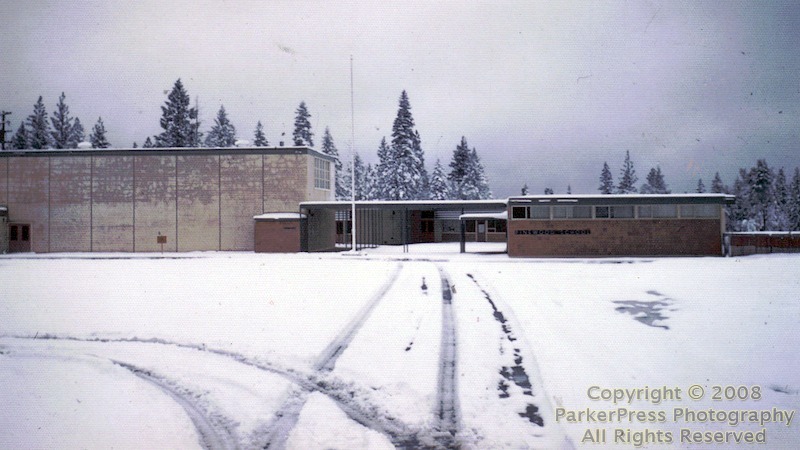 These rooms are still the main part of the present Pollock Pines School. The new school opened in September of 1937 with 38 children in Mrs. Baumhoff’s primary grades and 33 in Mr. Reece’s middle and upper grades. The Sly Park area was also in need of a school for the children of the settlers and workers in the many mills of that area. Blair Mill was there from 1890 until 1908. The Sly Park School District encompassed all of the area north of Camp Creek to the American River and west of Silver Fork to the Middle of Starks Road. The district border then followed Weber Creek up to Bullion Bend and the American River. That took in a large area, so Sly Park School District had a school in the location south of the meadow in the early years and later at Fresh Pond and Big Bend School at Pacific. About 1938 or 1939 the teacher at Pacific quit and another teacher couldn’t be found. All of those children came to the Pollock Pines School. Wildwood School, a part of the Pollock Pines School District, was also in session at the bottom of Forebay Road on the hill above the South Fork of the American River from 1928 until 1949. The children of the workers of the El Dorado Powerhouse attended school there. Robert Fisher of the Academy of Ballet in Placerville, attended that school. His father, Lucien Fisher, worked at the powerhouse. There was a fairly good sized settlement there at one time. When the powerhouse became automated in 1949, everyone moved away and the school was closed. 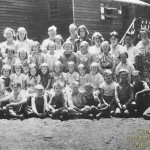 By 1940 a new teacher, Merry Phillips, was hired for the middle grades at Pollock Pines School. Her classroom was the cloakroom with 23 students in grades 4 and 5. The next year grade 6 was added to her class making a total of 37 students. The winters were long and cold and snow kept the students indoors, so the district decided to build an auditorium. This would allow for a place to play when the weather was bad and would also provide a place to eat lunch. Mr. Reece and Mrs. Baumhoff had begun the practice of serving hot chocolate and cookies to the children in cold weather. The parents decided to take turns preparing hot lunches for the entire student body and bringing the lunch to school. The parents also got together to can surplus food for the lunch program. Later the county financed a school lunch program and Mary Dittman was hired as the school cook. In the fall of 1942 Germana Gastaldi replaced Merry Phillips and taught in the auditorium. Miss Gastaldi married Mr. Ronish and after he died she married Mr. Wilson. She continued teaching here until her retirement in the middle 1960’s, touching many lives with her gentleness and dedication to children. The memory garden at Pollock Pines School was built in her honor. Many varied and beautiful flowers were planted there. By 1945 the auditorium was partitioned for two classrooms and another teacher was hired, Miss Verda Irvin. She continued teaching here until her retirement in 1980. She was an excellent dedicated teacher who will long be remembered for her vigor and enthusiam. There were altogether four teachers; Ruth Baumhoff, teaching grades one and two with 32 students, Germana (Gastaldi) Ronish, teaching grades three and four with 36 students, Verda Irvin teaching grades five and six with 37 students, and Harry Reece as principal, teaching grades seven and eight with 25 students. Big Bend School at Pacific was also in session again and had 23 students in the 1946-1947 school year. As can be seen from the enrollment figures there was a need for more classrooms and teachers. With World War II raging, building materials were at a premium and construction of more rooms not easily obtained. However, two rooms were soon added to the west at a cost of $18,000 each. Still later two more rooms were added to the south and another room to the east. The office was added and the stairway to the two original rooms enclosed. The school sort of grew as needed. A new school site on Pine Street was purchased and leveled in 1958 and construction began on Pinewood School’s multi-purpose room and two classrooms. Trailers were brought to the site to be used as classrooms. In 1960 Hans “Toni” Mayr was hired as the Superintendent of the growing, overcrowded school. He began a hiring campaign and the 1960-1961 school year was begun utilizing an overlapping schedule in the first through the fourth grades. This allowed double use of every classroom at Pollock Pines School. Half of the classes came in the early morning, leaving for lunch prior to noon. The other half came as the morning classes left for lunch, and occupied the classrooms until the morning classes returned from lunch. The afternoon classes then went to lunch. When the afternoon classes had finished their lunch period, the morning classes were dismissed to go home. This left the classrooms for the afternoon classes to use for the remainder of the day. This overlapping schedule was in effect until after Christmas when the rest of the classrooms at Pinewood School had been completed. Vern Whalen taught 51 eighth grade students that year in a small trailer. Ron Parker taught 45 fifth grade students in a trailer of the same size. Two portable classrooms were also used to house the large number of students. The enrollment had already outgrown the new school. The stage, office and kitchen were later added to Pinewood School. Toni Mayr had a talent for hiring dedicated teachers and creating a bond, an extended family feeling, between staff, community, and parents. The school, as earlier, was the heart of the community, providing entertainment through the sports program and other activities. Pollock Pines Recreation Unlimited, a community oriented organization came about through the efforts of Toni, Larry Slater, Ron Parker, Doris Cloherty (who was a very active and accomplished member of the school board) and many of the community members including Harry Dowdle and Bill Piazza. Their goal was to help develop activities and facilities for the youth and adults of the area. Creating a community park with ball fields, tennis courts, and a swimming pool was a goal set by the organization. Forebay Park was one of the outcomes, especially through much effort, labor, and perseverance of one individual, Harry Dowdle. It was not feasible at the time to have every facility at one location and the tennis courts were put on the Pinewood School playground for ease of upkeep. The tennis courts were a dream of Doris Cloherty and the Recreation Unlimited helped them become a reality. A swimming pool was included in the plans, but a concensus of a location and upkeep could not be reached and the plans were dropped. Swimming lessons were included in the summer school instruction, however. 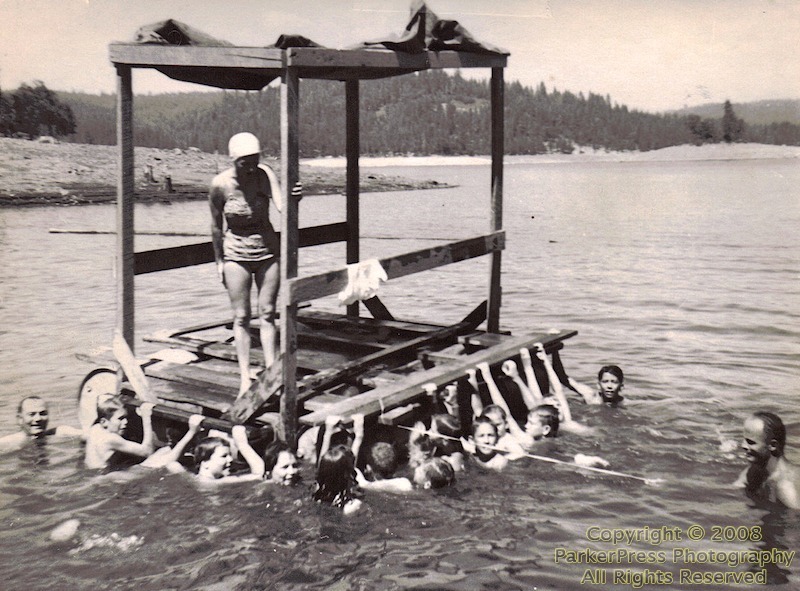 The pool at Wagon Wheel Trailer Park, and the lake at Sly Park was utilized. 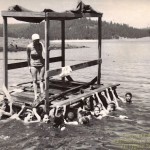 A raft at Sly Park, the brainstorm of Larry Slater, was used as the rest area. Many dedicated teachers have been with the Pollock Pines School District for nearly thirty years and are pioneers in their own way. Ron Parker first came to the district in 1960 as a fifth grade teacher. He then taught seventh and eighth grade science before becoming one of the first two elementary school counselors in the county serving students county wide. One of the accomplished goals of this counseling team was to implement The Developmental Placement School Readiness Program in kindergarten and first grade. With the passage of Proposition 13, schools were without money for counselors, and Ron became an assistant principal then the principal at Pinewood School. He later returned to the classroom before going once again into the field of elementary counseling and is at the present time serving the three schools of the Pollock Pines School District. 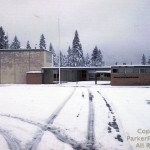 Bill McCown came to the Pollock Pines School District in 1964 and later served as principal of Pinewood for many years before returning to the classroom. He was instrumental in setting up and continues to be active in many of the athletic programs that now exist both at the site level and county-wide. He was also active in the establishment of an inter-related family history, social studies, literature program. Roger Chappell came to the district in 1962 as a sixth grade teacher and later moved to the seventh and eigth grade science department. With his expertise and interest a camping science program was developed for both summer and winter. Roger received the honor of being recognized as a Fellow of Science; one of only 25 teachers of the junior high school, high school, and university level in the entire state of California to be chosen to attend the California State Science Academy. He was the only representative of Northern California. He was also selected as the Pollock Pines School District’s first Teacher of the Year in 1988. John Van Sant’s field of knowledge was in the ornithology department. Hundreds of students over the past twenty years have become experts in the field of bird study and identification. Pollock Pines School District now has a remarkable bird collection due to his efforts. John came to the district in 1960 and retired in 1988. John, along with Roger and Ron were recently recognized for their efforts in establishing the arboretum at Pinewood School. Art Waugh came to the Pollock Pines School District in 1961 as a fourth grade teacher. He started many adult education classes in drawing and painting and stimulated many budding artists, both young and old to develop their talents. He retired in 1986 but continues to share his talent with the school district on a part time basis. School enrollment here, as in all of these foothills, is still on the increase. A new junior high school, Sierra Ridge, opened in September of 1988 housing grades six, seven, and eight. Grades two through five are at Pinewood School and kindergarten, junior first, and first grades remain at the old Pollock Pines School. The opening of a new middle grade school on the same campus as Sierra Ridge is projected for 1992.